Trading Places! Southampton Port's role in global trade. 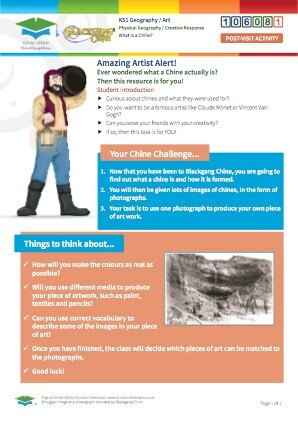 Students will learn about trade and why and how trade occurs. 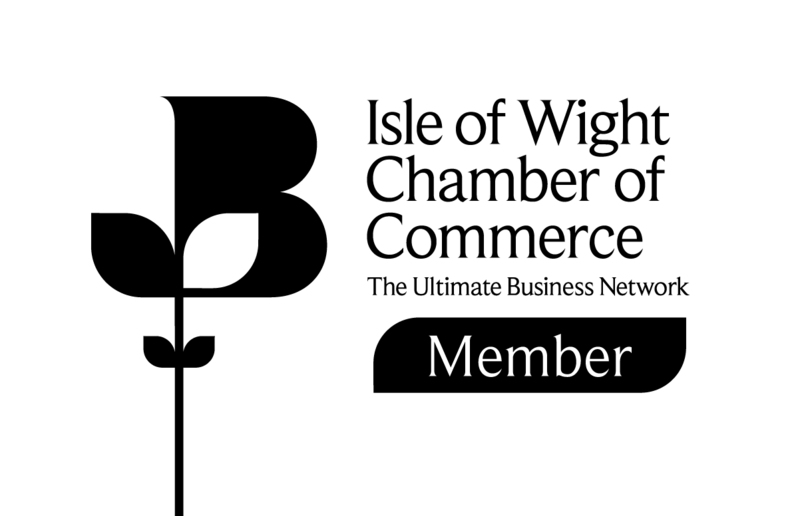 They will investigate the types of trade that go through Southampton Port, and will make direct observations of a wide variety of vessels on Southampton Water and The Solent to illustrate the range of economic activities and trade there. 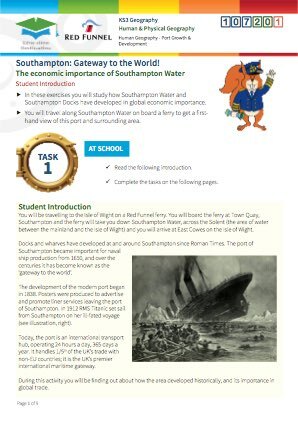 They will then investigate the origins and destinations of different vessels using Southampton Port and, by plotting this information on a world map, they will gain an understanding of trading links and partners. 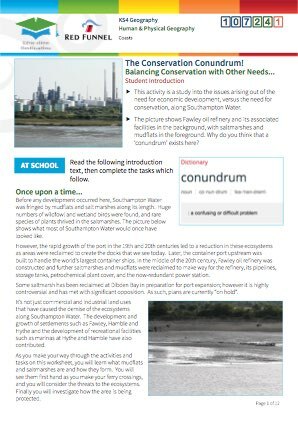 This is a geography resource which engages students with the environment of Southampton Water and The Solent, whilst on their Red Funnel ferry journey across to and/or from the Isle of Wight. 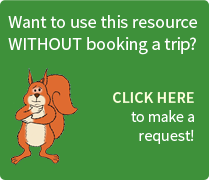 It includes pre-visit, on-site, and post-visit activities. 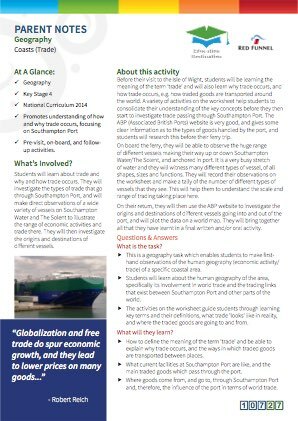 This resource focuses mainly on the human geography of the area, specifically focusing on trade, and it leads students through understanding what trade is, and why and how trade takes place as background to the fieldwork. On board the ferry they then observe the different types of vessels using Southampton Water and the Solent, as evidence for the wide variety of trade taking place here. 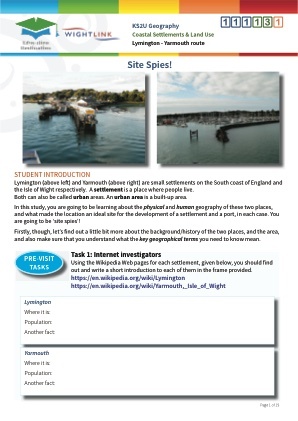 On their return to school, they then use the ABP (Associated British Ports) website to further investigate the origins and destinations of the vessels using the port, and thereby gain an understanding of the trading partners and trade links that exist between the UK and other parts of the world. 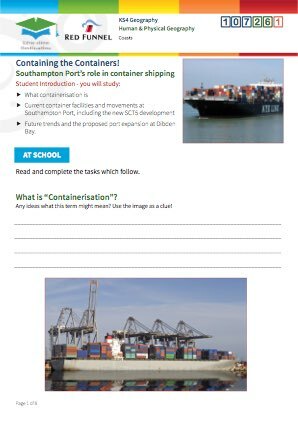 The pre-visit activity starts by introducing the idea of containerisation to students, and they are prompted to consider what they think the term means. 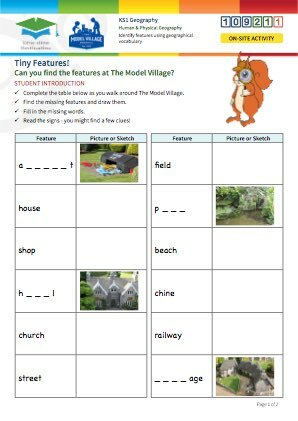 Key terms are provided in a word box and students complete a definition. 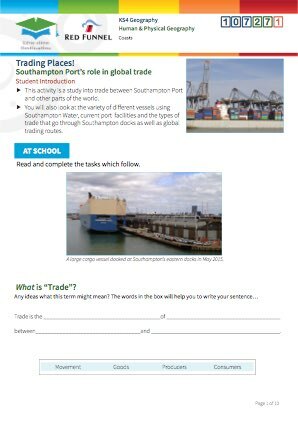 The worksheet then guides them through what trade involves, and why we trade, and a sentence sorting activity summarises this section. The ‘How we trade’ section is designed to get students to start thinking about the ways in which traded goods are transported, as a means of ‘setting the scene’ for the various types of vessel and the different port activities they are likely to see from the ferry. 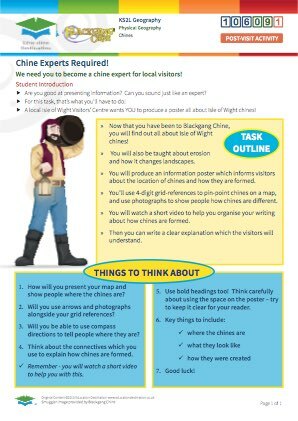 Students, especially more able students, should also be encouraged to consider the less-obvious types of trade, such as ‘financial’ trading or the types of ‘trade’ that involve services e.g. cruise ship travel. There is an optional extension here, on the higher ability worksheet; to look at trade in terms of how fair it is, e.g. looking at trading blocs and organisations that control world trade. 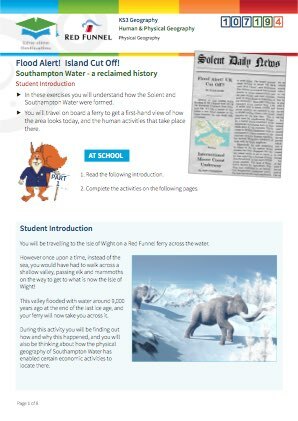 Finally, before they take the ferry, the worksheet provides students with a bit of background information about Southampton Port, and a link to the ABP website. 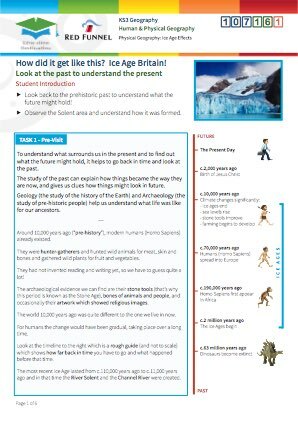 They complete a table to summarise what they find out, and sentence starters / gap fill enables less able students to record the information more easily. 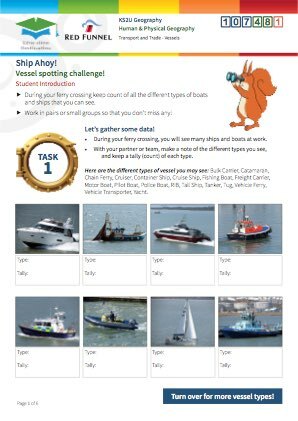 On board the ferry, the task is quite straight-forward; students complete a table which is all about the different types of vessels they may see as they make the crossing to/from the Isle of Wight. 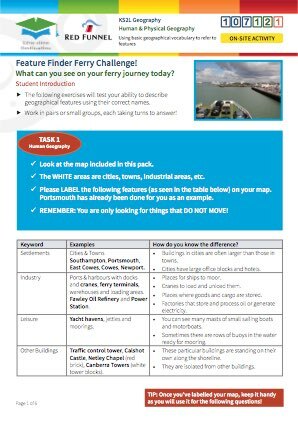 It may be beneficial to complete the first columns of the table before boarding the ferry; these involve matching the pictures to the vessel type in the table, and (in the case of the higher ability worksheet only) giving each category an appropriate title. 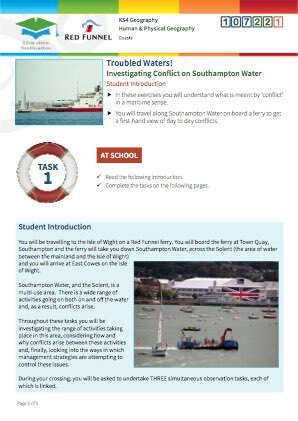 The main activity on board involves observation, and students will need to keep a keen eye on the variety of different types of vessels they see, and keep an accurate tally as they go. There is a frame provided for them to draw a graph showing their tally totals if desired. 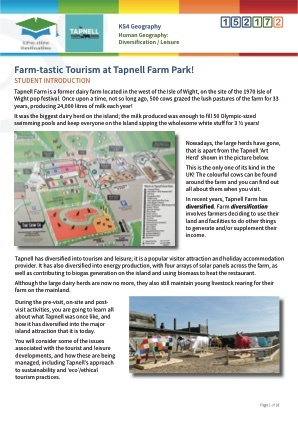 The post visit activity involves research. 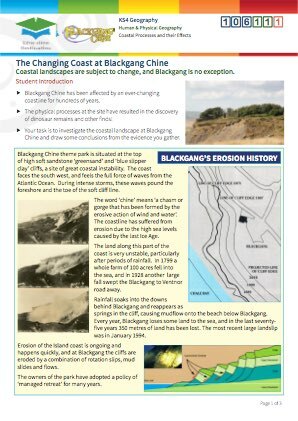 Students are given a section of the ABP website to use (via the same web portal link as above). This gives a great deal of information about the movements of vessels, of all types, in to the port, within the port, and those leaving the port. 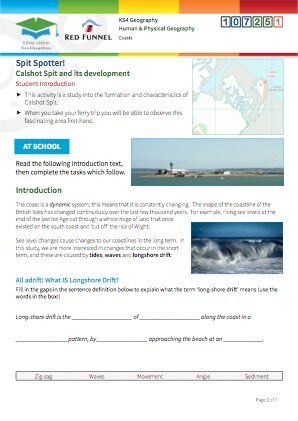 There are 5 main sections and the worksheet is written so that this can be done as a group activity, whereby each one of the 5 groups investigated a different section of the website to gather information on the origins and destinations of vessels using the port. 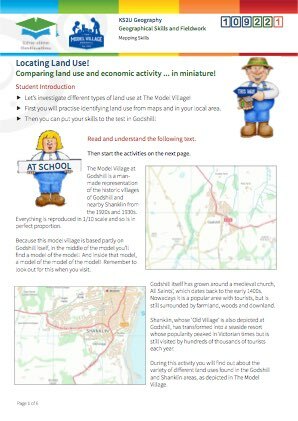 Students are provided with a blank world map to accurately locate these places and to name them as they go through the information on the website. 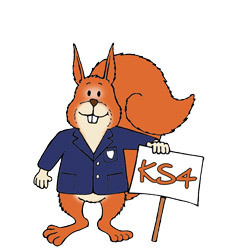 Once they have finished, one member from each group will then recombine with members from the other four groups so that each group will now contain a student representing each of the 5 sections. 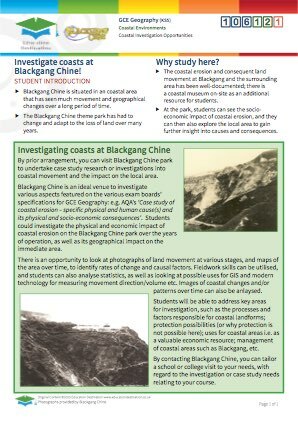 Students will need to be provided with a larger world map, and they can now summarise their findings on that may by each member contributing their ‘data’. 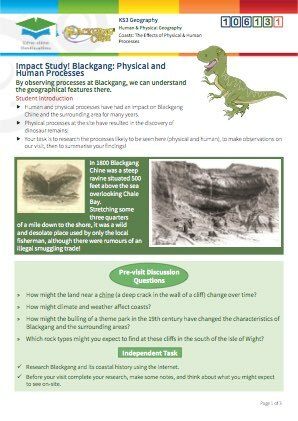 Concluding findings in some way is suggested, either through a written summary and/or an oral presentation, and headings are suggested as a structure for this. 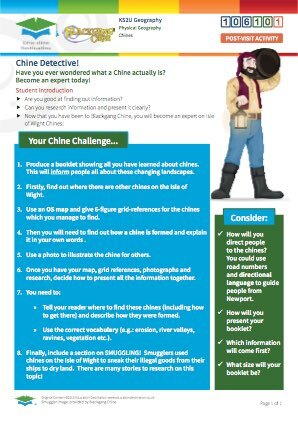 Students will learn what trade is, and some background detail as to why and how trade takes place. 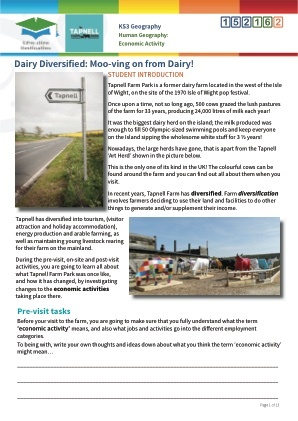  They will learn a little bit of background about Southampton Port and the types of trade that go through the port. 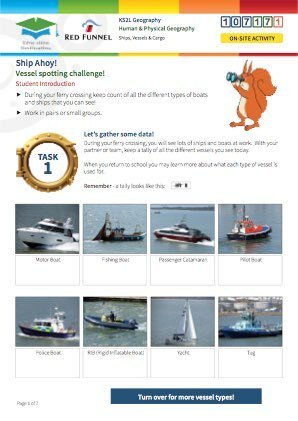 Students will see the types of vessels at the port, and travelling to and from it, in order to complete a tally chart. 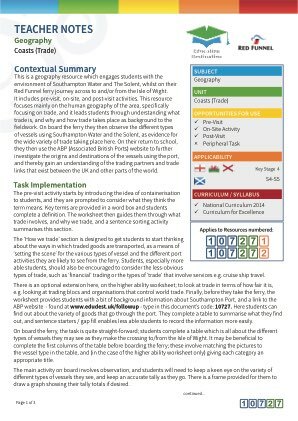 Students will be able to define what trade is, and will be able to explain why trade takes place and the main ways in which traded good are transported. 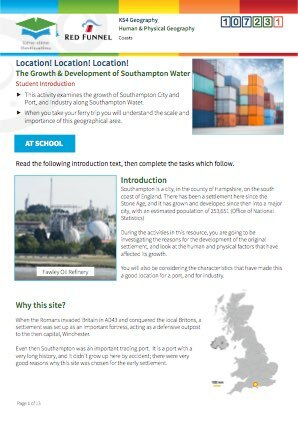 Students will know what types of trade/goods go through Southampton Port. 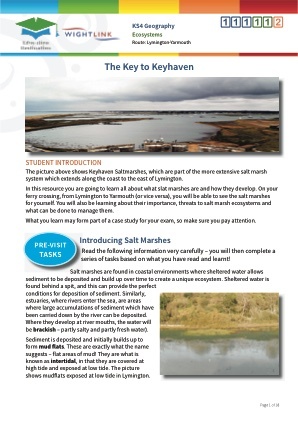 Students will be able to name a wide variety of different types (and categories) of vessel, and have an understanding of what each type does. 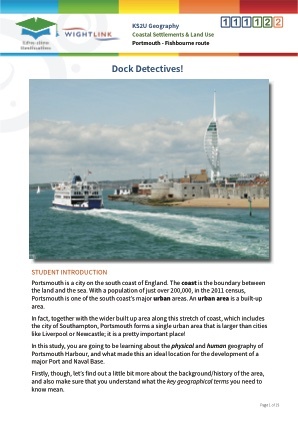 Students will conduct independent research to find out more about the movements of vessels into, around and out of Southampton Port, and will produce a detailed world map showing trading links/ partners with other parts of the world.